Haryali Chicken Kabab is one of the many varieties of Indian kababs generally served in almost every Indian Restaurant. 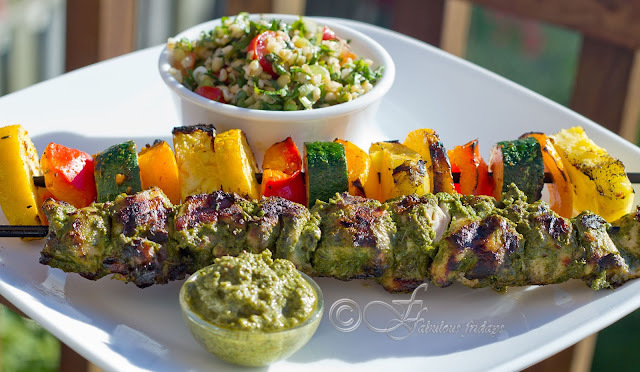 In Hindi the word 'Haryali' means greenery and haryali chicken kabab literally translates to chicken kebabs with greens paste. Boneless chicken pieces are marinated in a mixture of curd, spinach and several other greens, then grilled to perfection. To make the aromatic green marinade, I used five green leafy veggies and herbs - spinach, methi(fenugreek), coriander, mint and dill. You can combine the greens in any proportion as per your taste. For my family's palette these proportions worked very well (see recipe below). Give a minimum of four hours marination time for the chicken to pick up all the aromatic flavors. I added very few spices so as not to divert the flavor from the greens. To accompany these gorgeous kababs I opted for a colorful palette of chunky veggies (very simply flavored) and nutrient packed Tabbouleh salad (find the recipe here). Clean the chicken and cut into bite size chunks. Season with salt and pepper and sprinkle lime juice on them and keep aside while you prepare the marinade. Roughly chop all the greens. Combine methi, spinach, coriander, mint, dill, ginger, garlic and green chilies. Grind into a smooth paste using 1 tablespoon oil and a little bit of the yogurt. This will take some manipulation as you don't want to add any more liquid than necessary to grind. I used almost half the yogurt for grinding. Now add the rest of the yogurt and spices to ground paste. Remember chicken is already seasoned, so add salt accordingly. Marinate the chicken pieces in the green marinade. Cover and refrigerate for a minimum of 4 hours, so that chicken gets the aroma and flavors of green paste and spices. If you are using wooden skewers then don't forget to pre soak them. Thread the marinated chicken on to the skewers. Grill at medium high heat for 15-20 minutes till cooked through and evenly browned on all sides. If using the oven, cook for 15-20 minutes in a 350 F preheated oven. 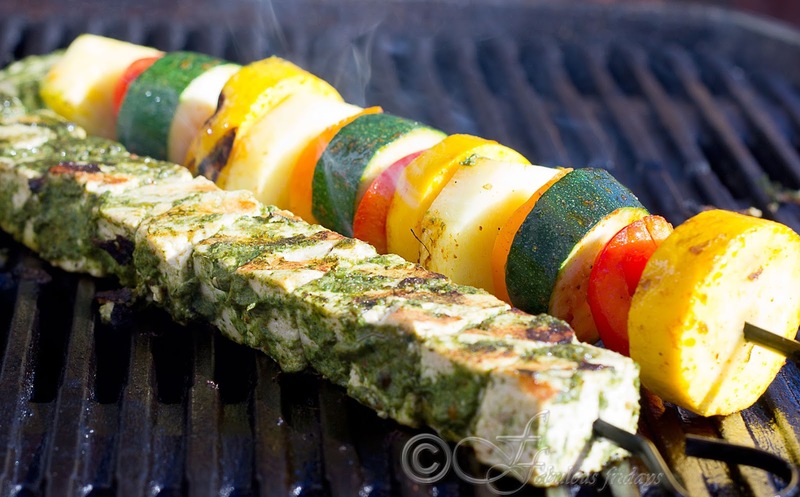 For both methods of cooking keep checking and turning the skewers to ensure even cooking from all the sides. Serve hot sprinkled with lime juice. Use any veggies you like or that are seasonally available like mushrooms, cherry tomaoes, onions, peppers, zucchini, etc. I used a combination of colored peppers, green and yellow zucchini and pineapple. I kept the dressing very simple so as not to have a flavor competition with the chicken kababs. Cut all the veggies into chunky pieces suitable for cooking on the BBQ. Put all the veggies in a large bowl and add olive oil, lime juice, salt, pepper and oregano. Mix thoroughly and then arrange them on skewers ready to cook. Grill on high till tender crisp. 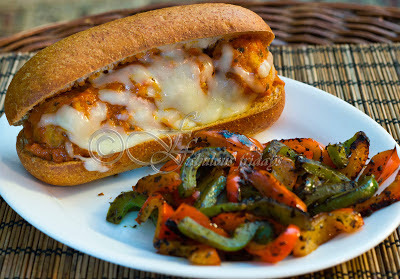 For a vegetarian option substitute chicken with paneer or tofu and proceed with the above recipe. Comes out super delish. Just alter the cooking time. Here is a picture of tofu haryali kababs. This classic Middle Eastern salad is a refreshing parsley salad with bulgur wheat, cucumbers, and tomatoes dressed with a simple lemon vinaigrette. 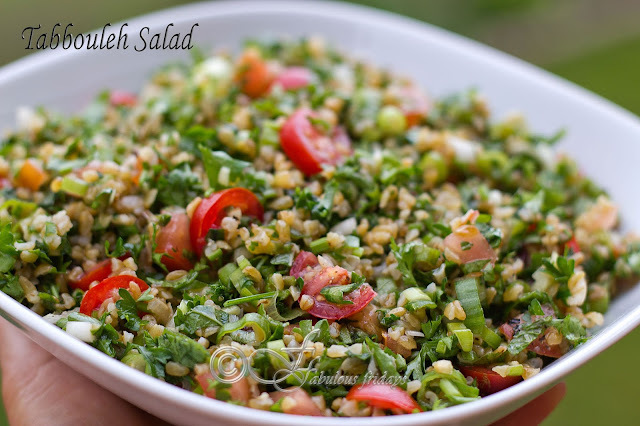 Easy to make, this salad can be put together with veggies and herbs that are available all year round and can be served a both - a delicious vegetarian lunch and a summer-suitable side. This dish requires very few ingredients and as with all simple recipes, it is important to use the best ingredients you can lay your hands on. Use a good quality extra virgin olive oil, fresh parsley and mint, sweet red cherry tomatoes and tender English cucumber. The recipe calls for soaking the cracked wheat in cold water, but in our house, we like it a little soft, so I used boiling water. Use hot or cold water as per your requirement to re-hydrate the wheat. Place cracked wheat in bowl and cover with 1/2 cup of boiling water. Soak for 30 minutes, drain and squeeze out excess water. Whisk all the ingredients of dressing together and keep aside. Chop green onions, mint and parsley fine. Dice cucumber thinly and quarter the cherry tomatoes. Add all the herbs and veggies to a large bowl. Add the soaked bulgur along with the dressing and toss everything together. Let the flavors blend in for an hour before serving. If you let the salad sit overnight, the flavors have a chance to merge and it tastes even better. 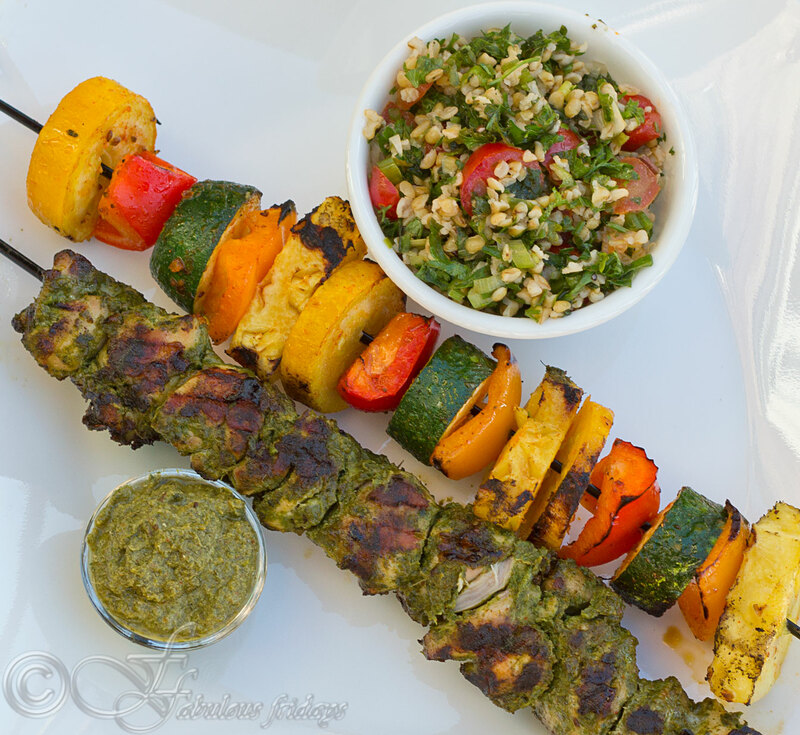 Serve as a side with any grilled or BBQ main dish. Add some drained canned chickpeas and serve as a Lunch salad. 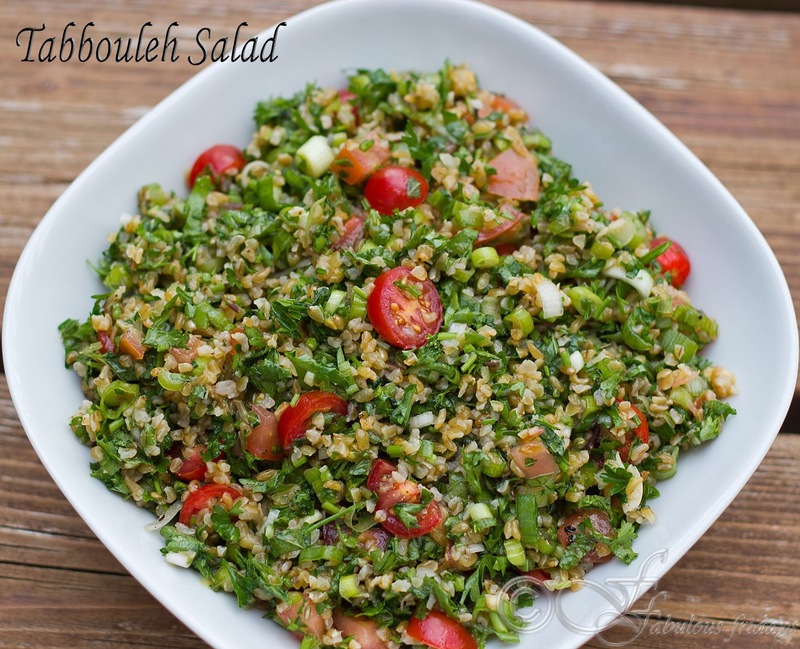 Substitute quinoa for cracked wheat to enhance the protein content. Rhubarb is a herbaceous fruit with red crisp celery-like stalks that have a tart flavor. This spring produce is delicious paired with sweet fruits such as raspberries, strawberries or peaches to counteract its tartness. 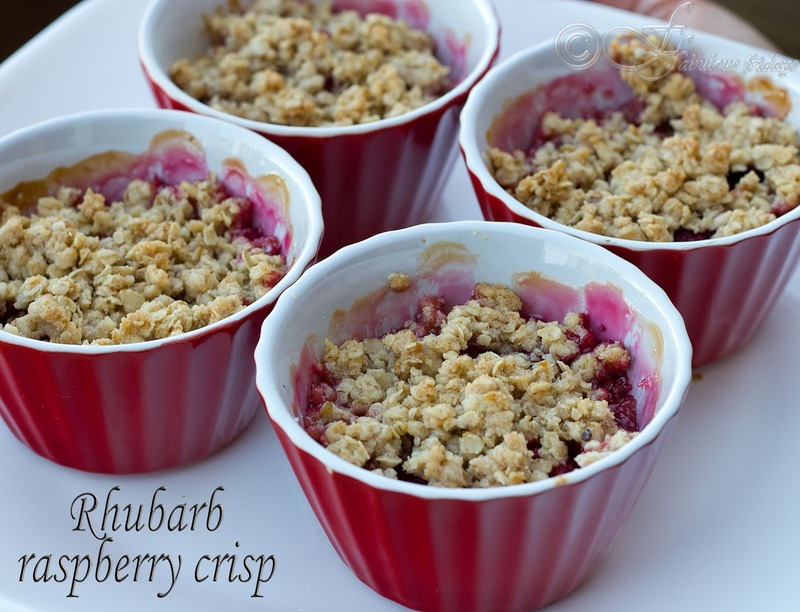 Here is a simple way to use Rhubarb. It is sure to satisfy every sweet tooth. Combine rhubarb, sugar, orange zest and juice in a large bowl and stir to combine. In another bowl, mix all ingredients for the crumble topping together and cut in butter until the mixture resembles soft bread crumbs. Use your hands, they work the best here. Divide the rhubarb mixture evenly among the ramekins. 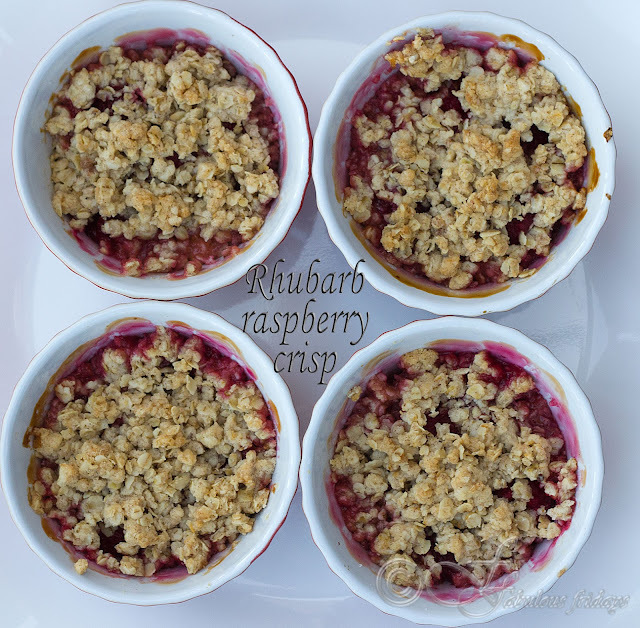 Scatter raspberries evenly over the surface and then spoon in the crumb topping to cover the fruit completely. Bake in the center rack for 35-40 minutes till topping is brown and crisp and juices are bubbling. Serve hot as is or with whipped cream or your favorite ice cream. These delicious Indian -inspired burgers feature mildly spiced mince chicken patties sandwiched between toasted mini naans. 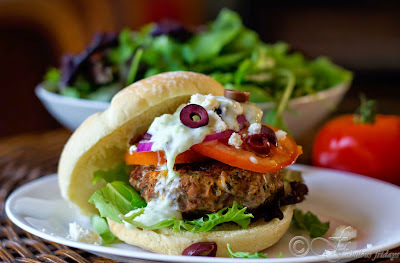 Topped with fiery red chili garlic chutney and a creamy, cool mint based yogurt sauce to balance the heat. I serve these with a side of mishmash salad called Kachumbar salad. For those with a high spice quotient, a couple of roasted green chilies complete the experience. 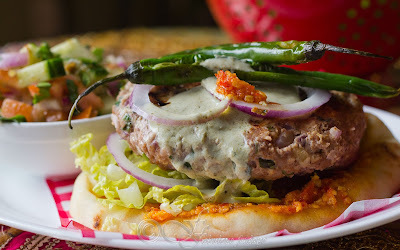 Do take out the time to make the two condiments - red chutney and mint yogurt sauce, as they really take the flavors up to a whole different level. 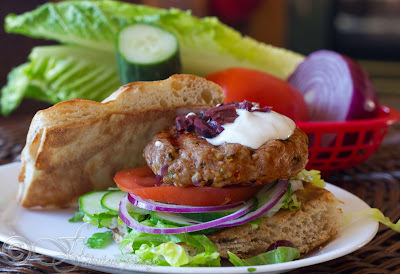 These juicy burgers are sure to be the star of your next barbecue. Mix all the ingredients together. If the mixture is too soft add some bread crumbs. It should be a fairly loose mixture. Spray whole long green chilies with some oil and grill them too for a minute or two till they char a little. Keep aside. For a Vegetarian option substitute mince chicken with paneer, tofu or boiled potato or a combination of these. I have also tried boiled soy granules mixed with boiled potato and boiled chickpeas with boiled potato. Just keep the flavoring same. You can pan fry or grill these. Comes out great. 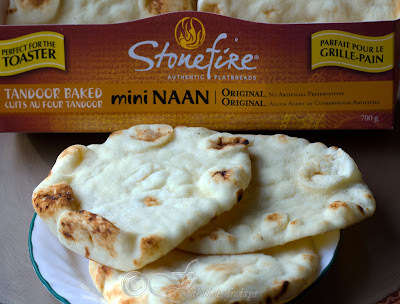 I served these on small round mini naans which I found at costco. If you cannot find the mini ones then just quarter the big naans and proceed. 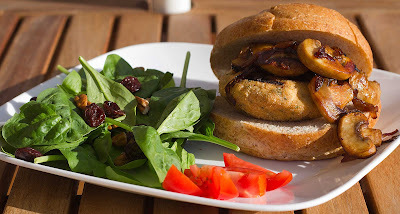 You can always use the regular burger buns as well. To serve lightly toast the naans and spread the chili garlic coconut chutney liberally. Place lettuce and onion rings on them. Top with the grilled chicken patty followed by more onion rings. Drizzle some mint yogurt sauce generously. Serve with a side of Kachumbar salad and a couple of fried/grilled green chilies. Dice all the veggies to bite sized pieces. Mix coriander, lime juice and season with salt and pepper. Let sit for 10 minutes before serving. Mix them together and adjust seasoning to your taste. This hot, spicy and delicious chutney is prepared using fresh chilies. 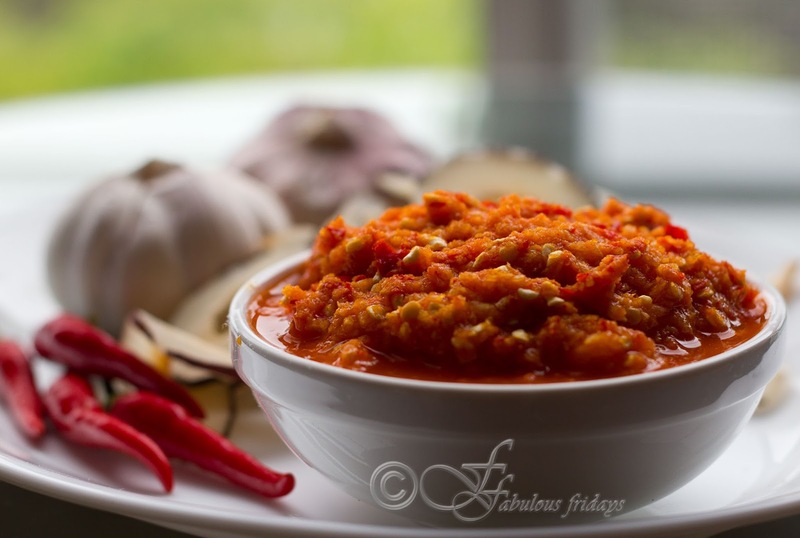 Fresh red chilies combined with loads of garlic and dry coconut gives a terrific flavor punch. Makes for a perfect condiment to serve idli or dosa, samosa or pakoda, in burgers and wraps, to boost flavor in stir fried veggies and curried dishes. I usually make a small batch using some oil and some water to grind the ingredients. This reduces the amount of oil I use. But if you want to make a larger batch, grind only in oil. Also pour some extra on top to create a seal. Your chutney will last longer. Grind the coconut, garlic, salt, and chilies together to a coarse paste using olive oil. Add some water if needed. Adjust salt (if using) to your taste. I usually make it with no salt (tastes just as good). Keeps well for 10 days in the refrigerator. Use more oil and no water- it improves the taste and texture and keeps longer. Add a tablespoon of roasted peanuts or roasted sesame seeds or both and proceed with the recipe. This variation is truly out of this world. Add a tsp of tamarind paste for a slight sweet-sour flavour. As spicy condiment for dosa, idli, uttapam, cheela, adai. As an accompaniment for fried street foods such as samosa, kachori, pakoda. As a spread for burgers, wraps and sandwiches. I also use it in stir fries and curries. 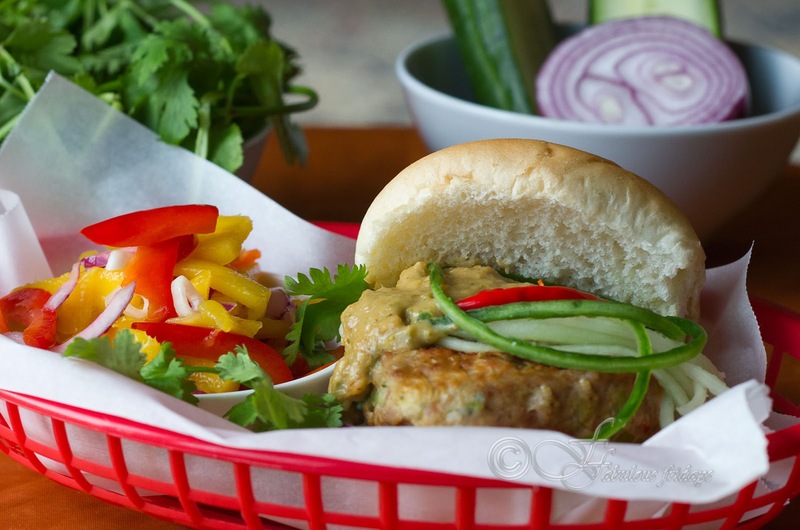 These burgers are inspired by the flavors of green curry paste from the Thai cuisine. The aromatic flavors of lime leaves, lemongrass, fresh ginger and garlic blended with spicy Thai chilies. 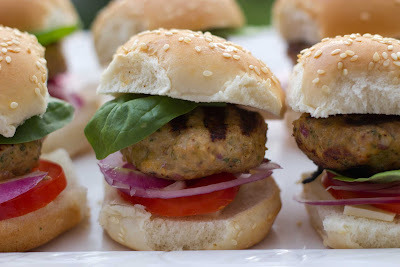 Serve these on burger buns with red onion rings, cucumber ribbons and handful of fresh coriander sprigs. If you have a high spice quotient then add in some red chili rings. Top it off with the crunchy satay sauce. 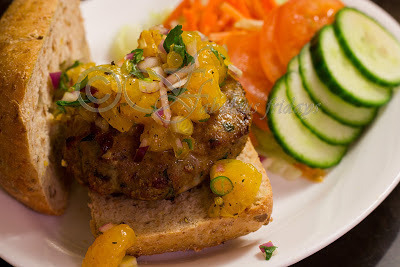 I served these delicious burgers with a side of Thai mango salad. 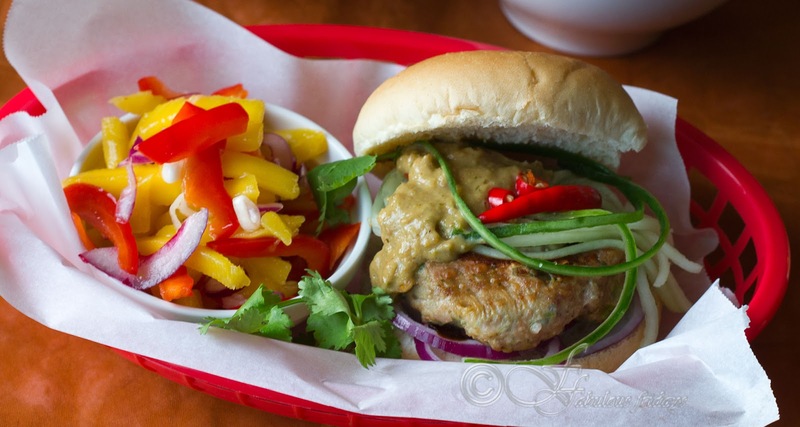 This adds the cool sweetness of mango and complements the spicy burger. If you are a fan of Thai cuisine then you will surely love these. I guarantee it. Mix all the ingredients together. If the mixture is too soft add some more bread crumbs. It should be a fairly loose mixture. Dry roast coriander and cumin seeds in a moderately hot skillet for 2 minutes until fragrant. Put the ground spice mix along with all other ingredients in a blender and process for 2-3 minutes into a thick and smooth paste. Refrigerate in an air tight container for a week. 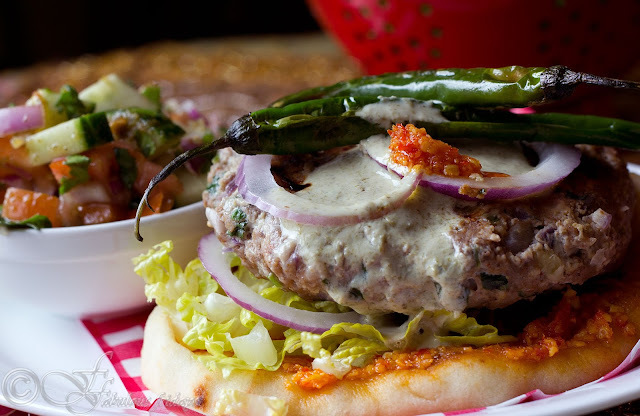 To serve place onion rings on the burger bun followed by fresh coriander sprigs. Top with the grilled chicken patty followed by cucumber ribbons and Thai red chili rings (if using). Drizzle some Nam Jim Satay (peanut sauce) generously. 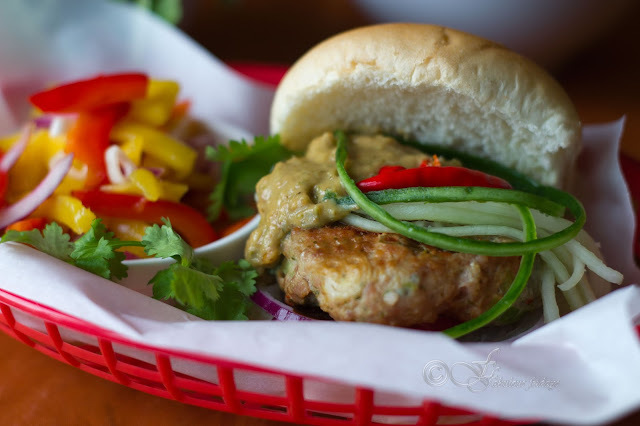 Serve with a side of Thai mango salad for an out of the world burger experience. For recipe of Thai mango salad click here.